The new ComponentOne Xamarin Edition beta brings a number of changes, and should be a significant improvement for many Xuni customers. Moving your project from one control set isn't a very difficult process, though each has some differences in API. In this migration guide we'll look at what it takes to move from Xuni to the ComponentOne Xamarin Edition by migrating the Xuni 101 projects to use the new controls. We've renamed the packages moving from Xuni to the ComponentOne Xamarin Edition so that the platform API should be more clear going forward and more closely aligns to Xamarin's. We've moved to a more consistent naming scheme for our controls based on the following pattern: C1.[Platform]. [ControlName] The packages have changed their prefix if you're coming from Xuni to C1. The object names for the controls have also been realigned to have a more uniform naming scheme that is either prefixed by C1 or Flex. For instance: Calendar -> C1Calendar Xuni.Android.Calendar now corresponds to C1.Android.Calendar Xuni.iOS.Calendar now corresponds to C1.iOS.Calendar Xuni.Forms.Calendar now corresponds to C1.Xamarin.Forms.Calendar Gauges -> C1Gauge Xuni.Android.Gauges now corresponds to C1.Android.Gauge Xuni.iOS.Gauges now corresponds to C1.iOS.Gauge Xuni.Forms.Gauge now corresponds to C1.Xamarin.Forms.Gauge XuniCollectionView -> C1CollectionView Xuni.CollectionView now corresponds to C1.CollectionView FlexGrid Xuni.Android.FlexGrid now corresponds to C1.Android.Grid Xuni.iOS.FlexGrid now corresponds to C1.iOS.Grid Xuni.Forms.FlexGrid now corresponds to C1.Xamarin.Forms.Grid Core Xuni.Android.Core now corresponds to C1.Android.Core Xuni.iOS.Core now corresponds to C1.iOS.Core Xuni.Forms.Core now corresponds to C1.Xamarin.Forms.Core Minor API Changes There are some minor changes in API between ComponentOne Xamarin Edition and Xuni. These mostly amount to additions, slight changes in syntax, and use of prefix 'C1' instead of 'Xuni' in class and object names (as illustrated above). If you evaluated Xuni in the past, but never purchased you also can try out the beta for a limited time. The beta allows an extended evaluation that last until September 1st 2017 without a key. 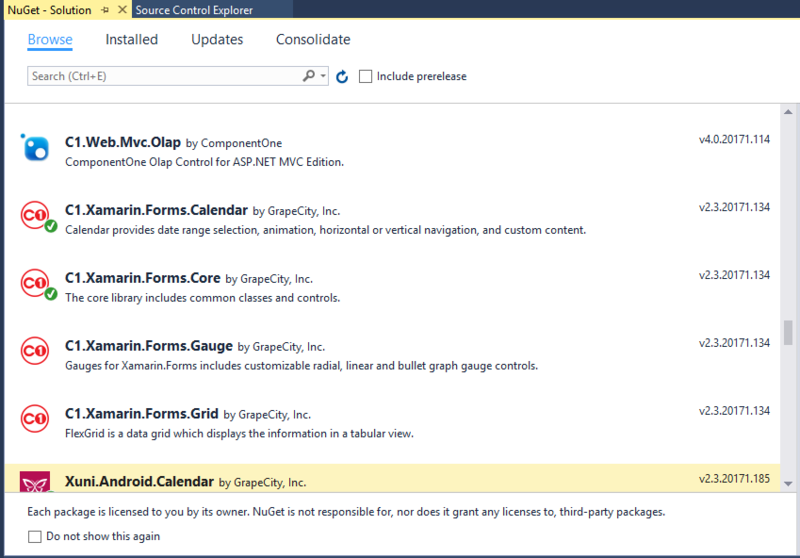 Migrating your projects is a matter of removing Xuni references for the older controls and replacing those packages with new C1 Xamarin Edition packages from the same GrapeCity NuGet feed. You'll notice also that some properties have subtly changed to make them feel more naturally .NET. For instance, in the Custom Appearance sample, the Duration property for the Animations is now a TimeSpan rather than an Int. That's basically the extent of the changes you'll need to make for the CollectionView. Since the control is non-UI you don't have to worry about the renderer in this case. We've also adjusted the CellFactory slightly by changing the CreateCell method to PrepareCell with a slightly different signature that should be easier to use. As we continue to refine ComponentOne Xamarin Edition, we will gradually emphasize this control set more and more. With the full release of the ComponetOne Xamarin Edition, we will be sun-setting Xuni as a product. Since currently licensed users can move to the new platform using their existing key, we feel that this will be the best experience for users going forward. It is a more stable and better performing product that we hope everyone gives a try.